See the mountains like you’ve never seen them before. Paddle along The Upper James River Water Trail. 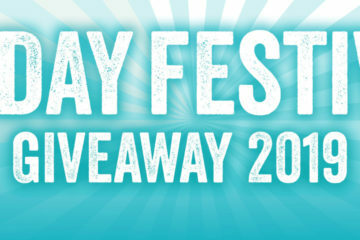 Winner can choose kayaks, tubes, or a canoe day trip. A quaint, historic log cabin overlooking the James River in Buchanan, Virginia. Three bedrooms and two baths, accommodating up to six guests. Fully equipped kitchen with a picnic area overlooking the river. Placed on the National Register of Historic Places, the theater plays host to exciting musical groups, film festivals and movies. Rules and Regulations: Package must be redeemed within 1 year of winning date. Entries must be received by mail or through the www.blueridgeoutdoors.com contest sign-up page by 12:00 Midnight EST on June 31, 2016 – date subject to change. One entry per person. One winner per household. Sweepstakes open only to legal residents of the 48 contiguous United States and the District of Columbia, who are 18 years of age or older. Void wherever prohibited by law. 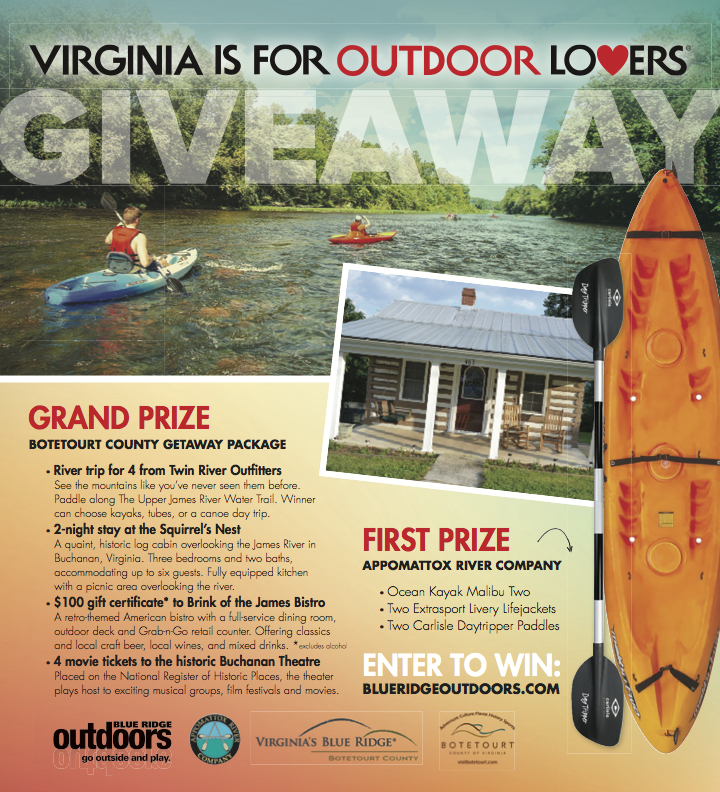 Families and employees of Blue Ridge Outdoors Magazine and participating sponsors are not eligible. No liability is assumed for lost, late, incomplete, inaccurate, non-delivered or misdirected mail, or misdirected e-mail, garbled, mistranscribed, faulty or incomplete telephone transmissions, for technical hardware or software failures of any kind, lost or unavailable network connection, or failed, incomplete or delayed computer transmission or any human error which may occur in the receipt of processing of the entries in this Sweepstakes. By entering the sweepstakes, entrants agree that Blue Ridge Outdoors Magazine and their promotional partners reserve the right to contact entrants multiple times with special information and offers. 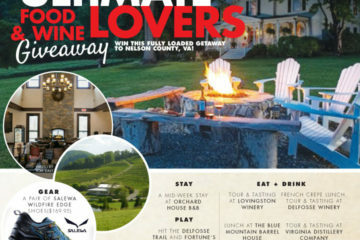 Blue Ridge Outdoors Magazine reserves the right, at their sole discretion, to disqualify any individual who tampers with the entry process and to cancel, terminate, modify or suspend the Sweepstakes. Winners agree that Blue Ridge Outdoors Magazine and participating sponsors, their subsidiaries, affiliates, agents and promotion agencies shall not be liable for injuries or losses of any kind resulting from acceptance of or use of prizes. No substitutions or redemption of cash, or transfer of prize permitted. Any taxes associated with winning any of the prizes detailed below will be paid by the winner. Winners agree to allow sponsors to use their name and pictures for purposes of promotion. Sponsors reserve the right to substitute a prize of equal or greater value. All Federal, State and local laws and regulations apply. Selection of winner will be chosen at random at the Blue Ridge Outdoors office on or beforeJune 31, 6:00 PM EST 2016 – date and time subject to change. Winners will be contacted by the information they provided in the contest sign-up field and have 7 days to claim their prize before another winner will be picked. Odds of winning will be determined by the total number of eligible entries received. Fully Loaded Food and Wine Giveaway!